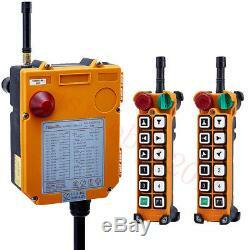 12 Keys Industria Radio Wireless Remote Control Transmitter+Receiver Hoist Crane. / Down, East/ West, South/ North, Function1, Function2. 1 x STOP impact switch. X Start button, 1 x Safety key switch. 866151mm 7.22.42 in. 4085 degrees Celsius (-40185 degrees Fahrenheit). AC/DC 12V AC/DC 18-65V AC/DC 65-440V(According you choose). 2 bits (4.3 billion). Up/down, East/ West, South/ North can be programmed to interlock or non-interlock. Transmitter and receiver labels use laser engraving technology. Waterproof, wear-resistant, clear writing, avoiding the important information is missing in harsh environments as codes and other issues. To provide more superior service for future use. Special button materials and high-quality switches. The LED on the front of the transmitter indicates the condition of the batteries. It will flash green during operation if the battery power is sufficient and will flash red if the battery power is low. If the LED is flashing red, or if the operation becomes erratic, or will only work from a short distance, replace both batteries with new AA alkaline batteries. Bridge Crane / Overhead crane / Chain Hoist / Monorails / Concrete Pump Truck / Mobile Lifting / Tower Crane. Please see the details above. FastToBuy is a worldwide industrial products online store of over million configurable and standard components. We are a leading provider for industrial automation control, CNC machine and electrical equipment. Each product, in which FastToBuy sales online, is subject to a 100% quality control. The item "12 Keys Industria Radio Wireless Remote Control Transmitter+Receiver Hoist Crane" is in sale since Wednesday, May 30, 2018. This item is in the category "Business & Industrial\Material Handling\Hoists, Winches & Rigging\Lifting Machine Parts, Rigging\Lifting Machine Remotes". The seller is "fasttobuy2012" and is located in shenzhen,Guangdong.